Anterior dental esthetics becomes crucial in patients with periodontal disease with open embrasures, increased crown height, black triangles. This article describes a technique for fabrication of gingival veneer for patients with black triangles and gingival recession. This is a conservative method of obtaining esthetics with the advantage of predictable esthetics. Chronic periodontal disease results in destruction and degeneration of the supporting bone and the supporting periodontium. In the advanced stage, it may lead to increased bone loss, attachment loss, gingival recession, mobility, and drifting of teeth. Bone loss in alveolar crest leads to loss of interdental papilla which further leads to the formation of black triangles. According to Tarnow et al., the distance between the contact point and alveolar crest should be at least 5 mm for the formation of the interdental papilla. Dental esthetics is affected not only by the dental component but also by the muco-gingival component. Even a well fabricated anterior restoration is considered a failure if there is a presence of black triangle or inadequate marginal and attached gingiva, especially in patients with high smile line. Management of gingival recession varies according to the classification of gingival recession. Class I and II can be managed surgically whereas severe and extensive recession in multiple teeth can be managed nonsurgically with a gingival prosthesis. Gingival prosthesis is a simple yet effective method for the management of gingival recession and black triangles. Gingival prosthesis is also called as flange prosthesis, gingival mask, gingival veneer prosthesis, gingival replacement unit, and artificial gingiva. A gingival veneer is a prosthesis worn in the labial aspect of the dental arch, which aims to restore the muco-gingival contour and esthetics in areas where periodontal tissues are deficient. Different materials used to fabricate include an acrylic resin (heat polymerized/auto-polymerized), silicones, porcelain or even resin composites matching the color of the gingiva. 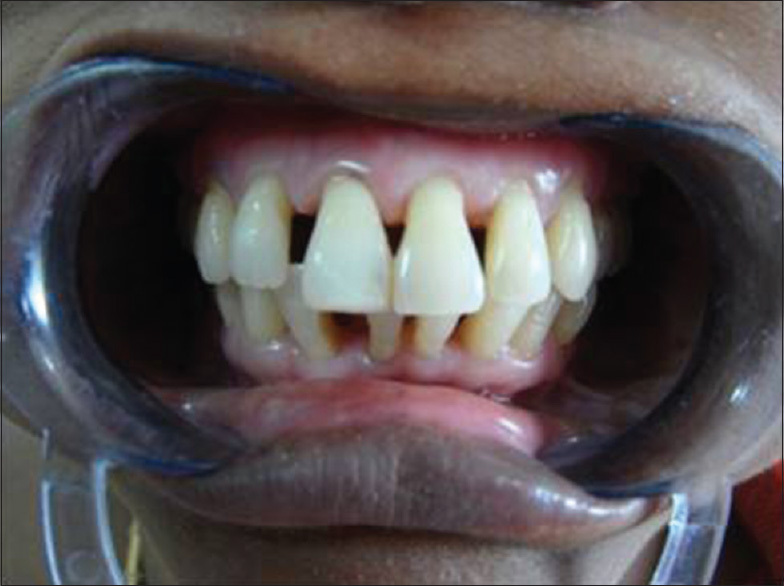 A 35-year-old female patient reported with the presence of black triangle between the central incisors [Figure 1]. On examination, the distance between the crest and contact point was found to be 8 mm. 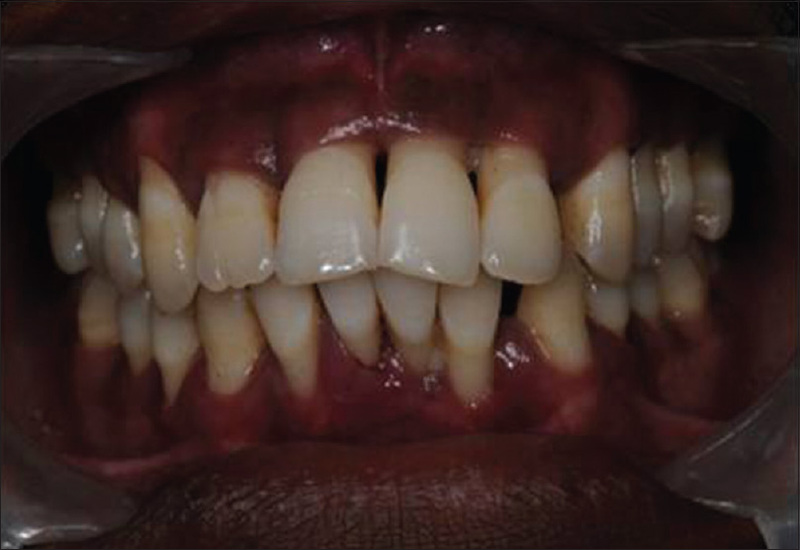 The patient was not ready for surgical management, so the case was selected for gingival veneer. Irreversible hydrocolloid impression made, and diagnostic cast poured. 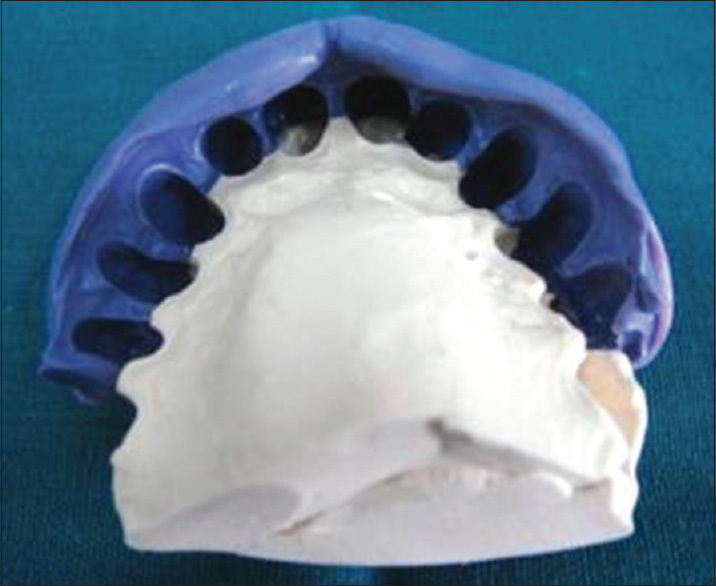 The sectional special tray was fabricated only for the labial side [Figure 2]. 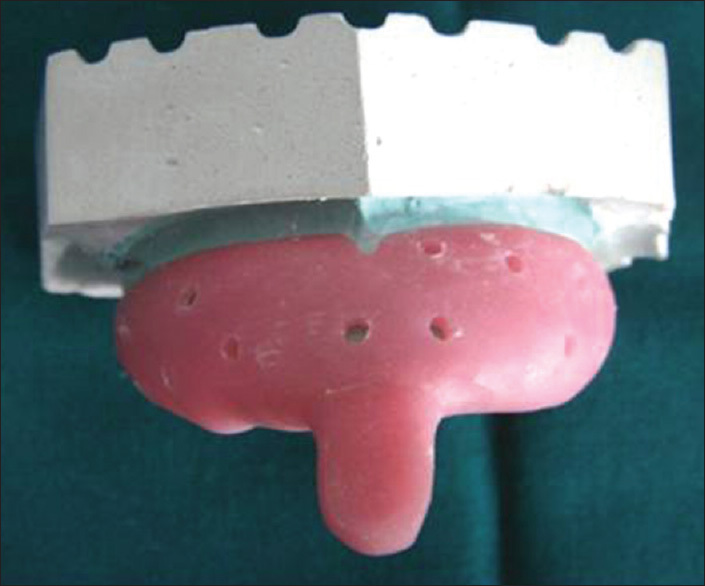 Split impression technique was used wherein lingual impression was made with addition silicone putty and the labial impression was made with polyether material [Figure 3] and [Figure 4]. The impressions were assembled [Figure 5] and master cast was poured in type IV die stone. 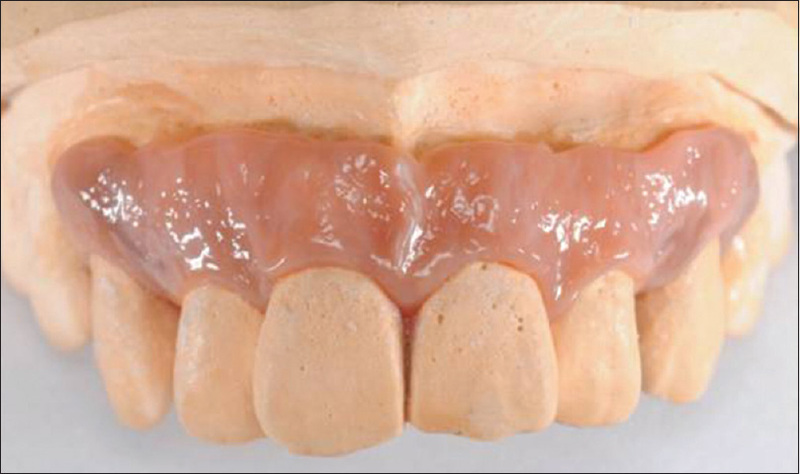 Wax-up of the prosthesis was done in the master cast, and the final prosthesis was fabricated in gingiva colored indirect composite [Figure 6]. The final prosthesis is evaluated for fit and esthetics [Figure 7]. An 18-year-old male patient reported with spacing in the anterior region. The case was diagnosed as generalized periodontitis with the gingival recession in the anterior region. 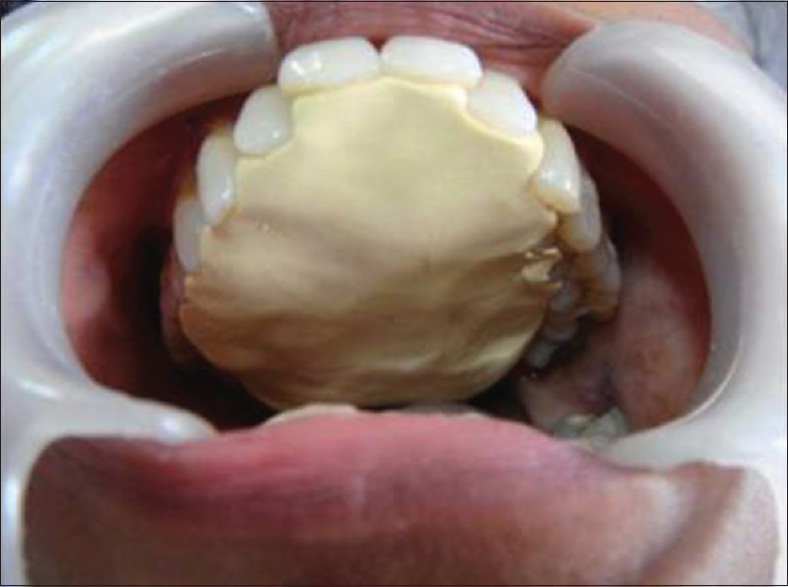 The case was taken for prosthetic management with gingival veneer. The procedure was done step-wise as in the first patient. 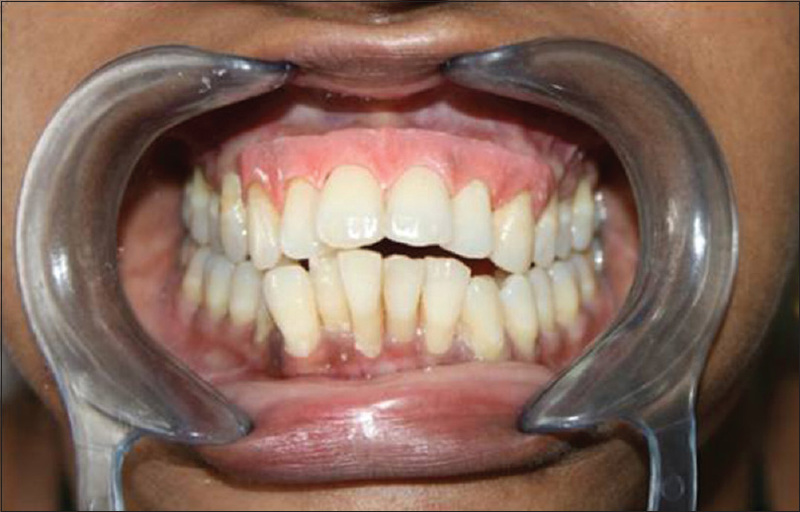 The prosthesis was fabricated with gingiva colored indirect composite material as there was melanin pigmentation which was difficult to match with acrylic resin [Figure 8] and [Figure 9]. 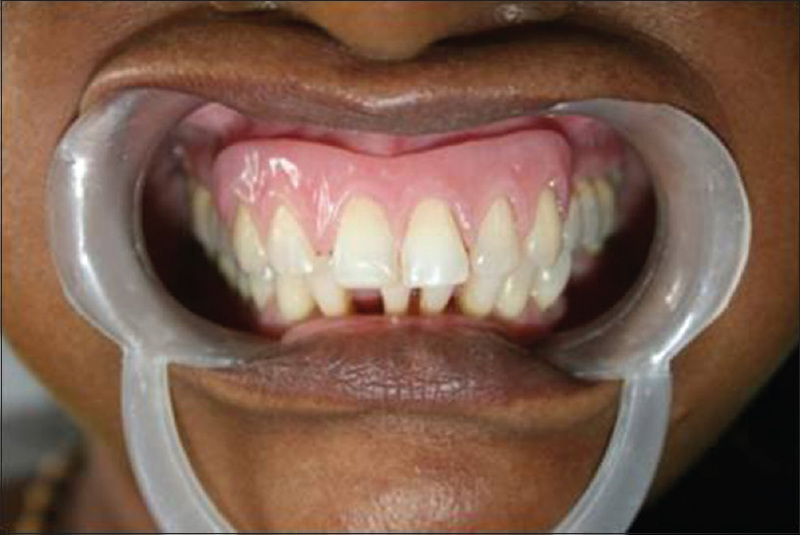 A 45-year-old female patient reported with generalized spacing in the teeth. 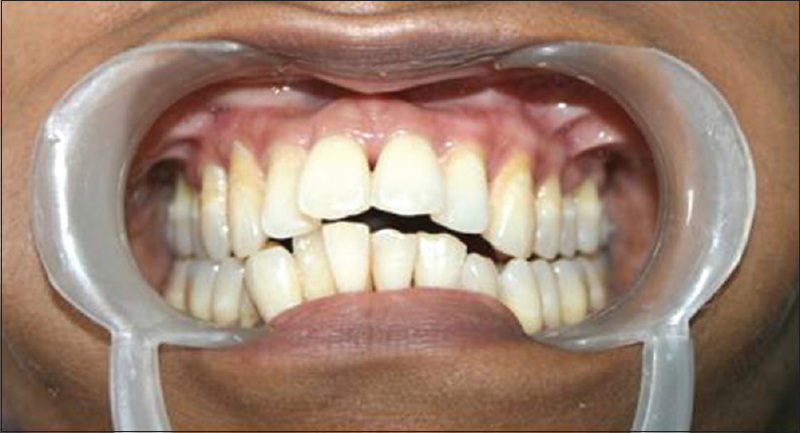 The case was prosthetically managed with gingival veneer following the same sequence of steps as described. The prosthesis, in this case, was fabricated with heat cure acrylic resin. The final prosthesis was inserted and verified for fit, retention, and esthetics [Figure 10] and [Figure 11]. Prosthetic management of black triangle and recession has been described in this article. This is a noninvasive technique with predictable esthetics, ease of fabrication, and the possibility of better maintenance. The authors would like to thank Dr. Backiyalakshmi, Periodontist for her help with the case selection. Newman MG, Takei H, Klokkevold PR, Carranza FA. Carranza's Clinical Periodontology. 10 th ed. St. Louis, Missouri, United States: Saunders Elseviers; 2007. p. 494-500. Tarnow DP, Magner AW, Fletcher P. The effect of the distance from the contact point to the crest of bone on the presence or absence of the interproximal dental papilla. J Periodontol 1992;63:995-6. Patel M, Nixon PJ, Chan MF. Gingival recession: Part 1. Aetiology and non-surgical management. Br Dent J 2011;211:251-4. Gopakumar A, Sood B. 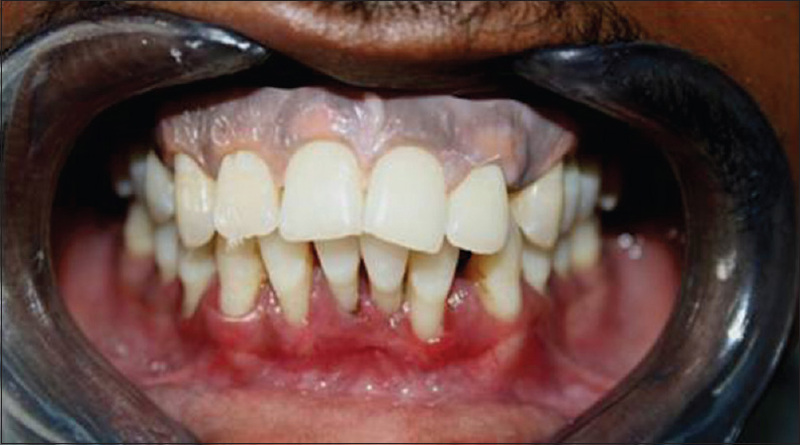 Conservative management of gingival recession: The gingival veneer. J Esthet Restor Dent 2012;24:385-93. Aswal GS, Nair CK, Vishwanath G, Vishwanath S. Split impression technique to fabricate acrylic gingival veneer. Int J Res Dent 2014;4:109-16. Greene PR. 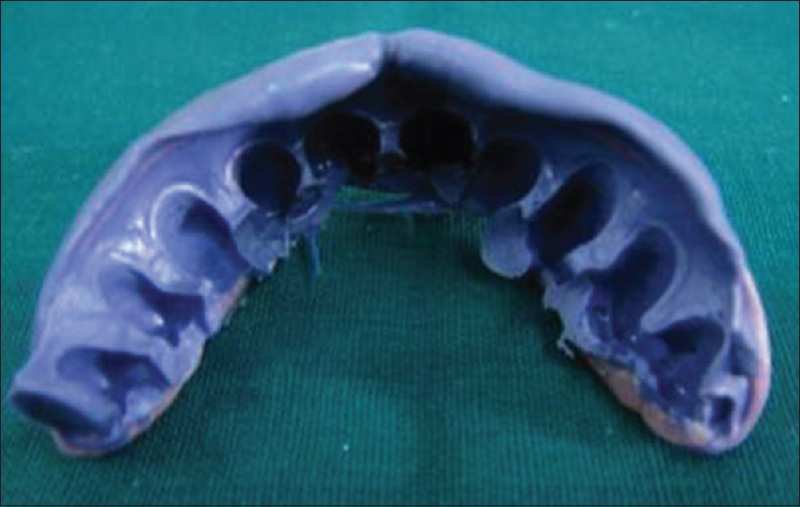 The flexible gingival mask: An aesthetic solution in periodontal practice. Br Dent J 1998;184:536-40. Mekayarajjananonth T, Kiat-amnuay S, Sooksuntisakoonchai N, Salinas TJ. The functional and esthetic deficit replaced with an acrylic resin gingival veneer. Quintessence Int 2002;33:91-4. Hickey B, Jauhar S. Gingival veneers. Dent Update 2009;36:422-4, 426, 428. Reddy MS. Achieving gingival esthetics. J Am Dent Assoc 2003;134:295-304. Yalamanchili PS, Surapaneni H, Reshmarani AP. Gingival prosthesis: A treatment modality for recession. J Orofac Sci 2013;5:128-30. Lai YL, Lui HF, Lee SY. In vitro color stability, stain resistance, and water sorption of four removable gingival flange materials. J Prosthet Dent 2003;90:293-300.